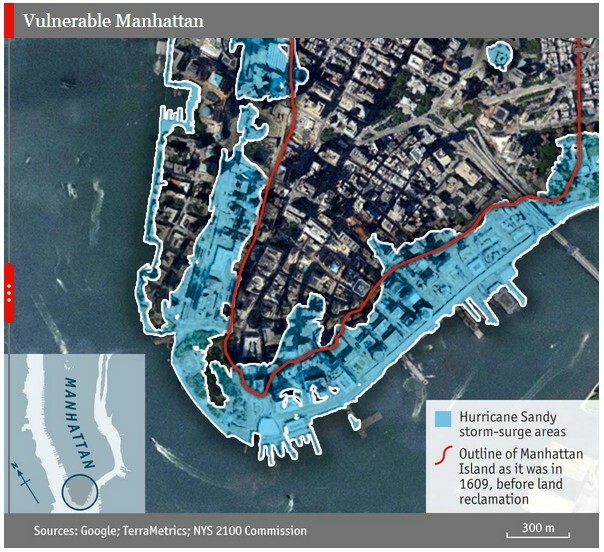 …as Hurricane Sandy showed last autumn Manhattan is vulnerable to rising sea levels: the districts flooded by Sandy corresponded almost perfectly to land reclaimed since the 17th century (see below). That land is far more valuable now than it was then: Jeroen Aerts and Wouter Botzen of the Netherlands’ VU University reckon the value of structures threatened by storms and floods has increased four- to sevenfold in the past century. Since the flood map was last updated in 1983, floor space inside the city’s flood plain has risen 40%, to 535m square feet. However, traditional flood-mitigation schemes, such as buying out householders or raising existing buildings, are impractical in New York. Seth Pinsky, who spearheaded the city’s post-Sandy adaptation plan, notes that New York now has 400,000 people, 270,000 jobs and 68,000 buildings inside the 100-year flood plain. Ground floors in New York are built for shops. Raising buildings would either be too costly, too destructive to neighbourhoods, or both. Turning the shoreline over to beaches, dunes or wetlands will not work in crowded Manhattan, which like many cities wants more development along its waterfront, not less. Some have proposed protecting the city with massive storm barriers at the mouth of the Atlantic Ocean, similar to the gates that protect London, Rotterdam and St Petersburg. But aside from the steep price tag (as much as $29 billion), such barriers could worsen flood risk for areas outside them. All around the world places near oceans and rivers will need to increasingly assess whether their building codes have allowed for levels of development that are simply asking for trouble when “once in a hundred year” floods start happening once every 5 or 10 years (or perhaps every year). A large flood in the Canadian city of Calgary is but one example of how areas of development are often right in the middle of the food plains of river systems. Engineering works can often mitigate flood risks but one wonders if any human intervention is really up to the task of “managing nature” (perhaps the ultimate human conceit?) and if indeed such attempts only serve to make matters worse. The map below shows the flood plains around the major rivers in and around Calgary; the areas flooded a few days ago map almost precisely to these age-old natural boundaries. Interesting analysis Bruce. Carefully thinking through the second- or third-order impacts of these projects is required to avoid wasting our effort or unintended negative consequences. The other piece of the puzzle is preventing the intensity and frequency of these floods from getting even more severe. Significant climate change is a given at this point so some of our effort needs to focus on how best to mitigate its impacts, but the resources required for this mitigation are far greater if the globe warms 4~6C than they are with half that much warming. Cities need to take a lead role on emissions reduction.